I’ve been toying with macaron recipes for some time now. In my recipes, there always seems like there is something that can go wrong. It could be the folding, it could be the unscientific drying time, or maybe it’s just my messed up oven, but something always goes wrong. Rarely do I get a sheet pan of perfectly formed macarons…until now. This recipe just plain works. This recipe uses Italian meringue, don’t let it scare you. This one not so hard part is the reason why they work so well. You don’t have to mess around trying to get macaronage since the meringue is very stable. One of the nicest parts of this recipe is that you can double it, split it into two parts, color/flavor each separately, and get two flavors for the work of one recipe. Process the ground almonds and powdered sugar in the work bowl of a food processor. Most recipes call for sifting, but I think this works better and gets everything combined. 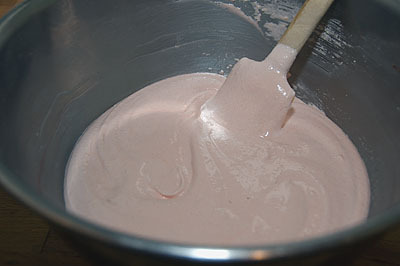 In a stand mixer, whip 60g egg whites to soft peaks, add 35g sugar. 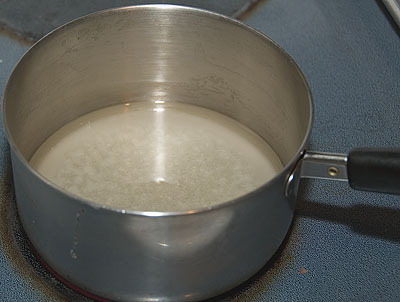 Slowly add the boiling syrup to the egg whites and continue to whip on medium – high speed until they are completely cooled and you have a shiny meringue (10-15 minutes). 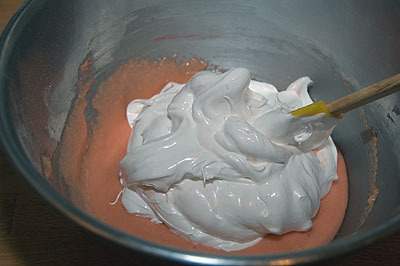 Mix the remaining 60g of egg whites and the sifted almond/sugar and carefully fold into the meringue. 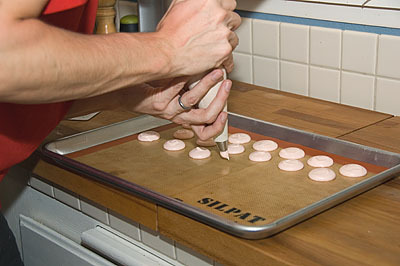 Fill a pastry bag fitted with a plain tip with the mixture and pipe macarons about 3 inches in diameter on silpat lined baking sheet. Bake at 320 for 15-25 minutes. Check to see if macarons are done by grabbing the top of one macaron and trying to shake it. They are done when the top barely slides against the skirt. 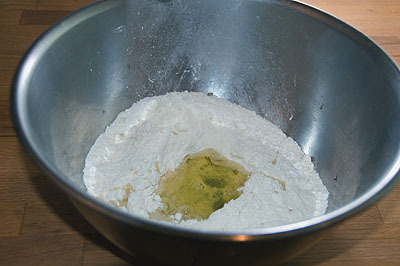 If they are not done, extend baking time by two minutes intervals, checking after each extension. When making macarons, you HAVE TO MEASURE BY weight. You cannot convert g to cups. It doesn’t work that way. You can pick up a digital scale for less than $20. It’s worth it. For those wishing for American conversions, I would highly suggest not converting the recipe. Scales that can do gram conversions are super cheap on ebay and amazon. I now have 2, but then again, I’m a culinary student where we only have a small number of scales in the labs, so I bring my own so I don’t have to beat someone with a spatula to get ahold of one. Grams are by far the most accurate measurement when it comes to baking. 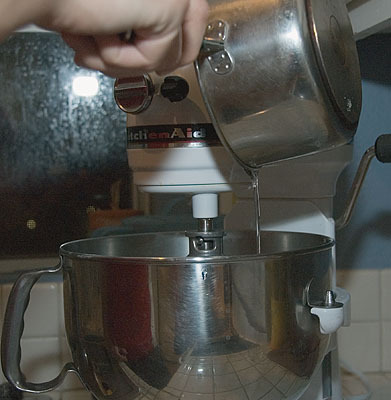 Professional bakers all use grams and ounces because it is measured by weight instead of by volume. When measuring in cups, it really makes a difference on how you even put the ingredients INTO the measuring cups. If you add sifted product, less will fit. If you do a dry-pack, more will fit, etc. My honest suggestion to just to invest in a little cheapy scale if you want perfect macarons, or honestly, any baked good. I am American, and I was so stubborn in transferring to the metric system, thinking it was going to be WAY too confusing. But now that I’ve seen the results of using grams instead of cups, my baked goods are a LOT more consistent AND it’s SO much easier to double, or even triple recipes! Just my words of wisdom, take it or leave it. Happy baking! Hi! I just used your recipe and my macarons exploded in the oven! Any thoughts on how this could’ve happened? I normally use the French method and have it down pat but I’ve been trying out the Italian method lately because I want a sturdier shell. I absolutely loved how your recipe gave me a super sturdy and ultra smooth shell but why do they keep bursting from the top? I’ve tried everything from 355 degrees F down to 305 degrees. I need to find a way to keep to your recipe because I LOVED the shell texture. Any thoughts? Thank you for such an awesome recipe! Urgent! When do I start to pre heat the oven? At the beginning or while making the macaroons rest? Can u double this recipe? I am disappointed because I cannot convert the measurements from grams to cups, etc. May i ask a question for this recipe ? One is i use convection oven ,i try so many times but always will make my macarons top surface so dark .how can i stop this happen to my macaron ? should i use fan bake or just upper and lower heat ? beside that ,i have do so many research for macaron recipe ,now i was wondering about the recipe of you ,i mean you show pic piping method to paper sheet ,do we need to rest our macaron for 15-30 min for get dry the macaron top shell ? or we just bake after finish pipe to sheet and just bake it ??? @Martha Andrews: it’s really easy if you have a digital scale that will do ounces or grams. My gran says that was the easiest thing to do when she started baking in the States. I would love an AMERICAN measurement version of this recipe! Once I have piped mine I leave them to rest. When they are not sticky to touch I put them in the oven. Great recipe used here in Australia! How do you make chocolate macaron.? And should it be a thermofan oven or not? Geek, thank you for elevating my macarons! i’ve been struggling with the french recipes that don’t use the sugar syrup because it sounded more complicated. 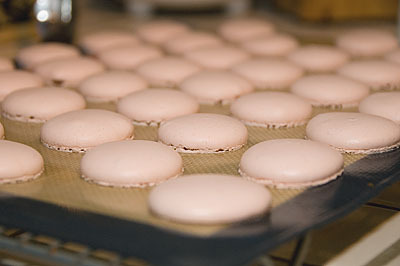 and the outcomes were always uncertain and fraught with macaron issues–cracked tops, no shine, no feet, too airy, etc. but the syrup was easy breezy and two batches have both turned out equally perfect with your recipe: perfect feet on each one, lightly shiny smooth tops, and AMAZING texture that is moist yet stable and uniform. THANK YOU for simplifying the process!